NASHVILLE, Tenn. (Aug. 24, 2015) - The Gospel Music Association (GMA) announces multi-Dove Award winning powerhouse Erica Campbell, the five time Grammy winner and WEtv star of the hit show "Mary Mary," and New York Times best-selling author Sadie Robertson as the co-hosts for the 46th Annual GMA Dove Awards (www.doveawards.com). Additionally, the Song and Songwriter of the Year categories are announced today. The Dove Awards will take place on Tuesday, October 13th, live from Allen Arena on the campus of Lipscomb University in Nashville, TN and will air exclusively on the Trinity Broadcasting Network (TBN) on Sunday, October 18th at 9:00 p.m (CST). For Dove updates and breaking news, please visit the Gospel Music Association's social networks on Twitter and Facebook. The full list of nominees can be found here: FULL LIST OF 46th ANNUAL GMA DOVE AWARD NOMINEES. "I'm super excited to be co-hosting the 46th Annual GMA Dove Awards this year," Erica Campbell says. "It's going to be an amazing night especially since I get to stand next to the lovely Sadie Robertson as co-host! I truly believe we are better together! I believe God smiles when we stand united for His Glory!" "I'm so excited to host this years Dove Awards," Sadie Robertson says. "It is a true honor to be able to share the stage with Erica Campbell, and it's going to be a great night. I am really looking forward to it!" Campbell recalls one of her fondest Dove Awards memories as she prepares for her hosting spotlight. "I remember my first Dove Awards performance with gospel legend Kirk Franklin at the Grand Ole Opry! Tina (of Mary Mary) and I were so nervous and excited! But the audience praised God with us as we sang Shackles! Our outfits were terrible but the night was amazing!" 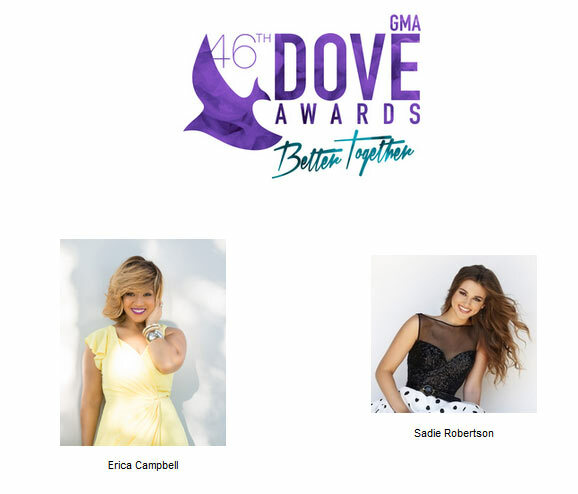 "I am elated to announce that Sadie Robertson and Erica Campbell will be hosting this year's Dove Awards," says GMA President and Executive Director Jackie Patillo. "Sadie is faithfully using her voice and celebrity to share how you can lead a positive and wholesome life, while enjoying your youth. Erica Campbell is a master at commanding the stage and we know she will have all of us in the palm of her hand on October 13." Last week, the GMA announced the nominees for the 46th Annual GMA Dove Awards with Lecrae leading the pack with 9 nominations, followed by for KING & COUNTRY with 7 and Crowder and Matt Maher each receiving 6. The GMA Dove Awards will feature artists from every style of Gospel/Christian music coming together to celebrate the impact of its music. Dove Award nominees are determined by over 1,500 professional members with the winners will be voted on by the entire GMA membership of nearly 2,500. The awards are produced by the GMA. After seven Mary Mary albums and 14 years as part of the groundbreaking duo, multi-Grammy Award-winning artist Erica Campbell released her debut solo album Help in 2014. Led by the singles "A Little More Jesus" and "Help," it entered Billboard's Gospel Albums chart at #1 and peaked at #6 on the all-genre Billboard 200. Campbell's solo debut earned a Grammy Award for Best Gospel Album, and she released Help 2.0 earlier this year. So far in her career, Erica has won eight Dove Awards and 17 Stellar Awards. Erica also stars in the hit WEtv originally scripted show "Mary Mary." In addition to her solo career, Campbell continues to perform with Mary Mary and collaborates with her husband, producer Warryn Campbell II. Sadie Robertson is well known for her dimples and engaging smile, but there is more to the 18-year-old charmer and star of A&E's Duck Dynasty than that. A high school athlete and motivational speaker, Sadie spends her summers on mission trips and working at a Christian youth camp spreading her message to peers about being confident in who you are and learning to "live original." Sadie continues to serve as a positive role model to young girls across the country, catering consistent, positive messages of encouragement to over 3,000,000 followers across her social platforms. Combined, her YouTube videos have more than 50,000,000 views. Sadie's new book, Live Original: How the Duck Commander Teen Keeps It Real and Stays True to Her Values, is available now at retailers nationwide.